Recently we got hold of the new NVIDIA GeForce RTX 2080 Ti graphics card. Our initial tests show that it is about 75% faster than the previous flagship GTX 1080 Ti as far as Volume Rendering is concerned. Just take a look at this chart. This increase in speed allows for using VR on 4K monitors and still maintain fluid interactions: https://www.youtube.com/watch?v=lqSk_NDndIw. We have refreshed the tutorial showing how to install RadiAnt on Mac computers. This video depicts the installation process on the latest macOS High Sierra systems. GPU acceleration makes a difference in 3D VR/MIP interactions, if your system is configured with a fast Nvidia GPU. 3D Cursor lets you easily identify the same location on multiple 2D series having the same or different image planes. We added some diversity to the 3D VR window - there are several 3D presets available for spicing up your 3D renderings. Finally, you can send studies to RadiAnt from other PACS locations without the need to initiate the download on the client PC. Our manual was updated to the latest release. So was the template in the translation tool - you can now complete missing items in your translations. Check the full changelog and download here. 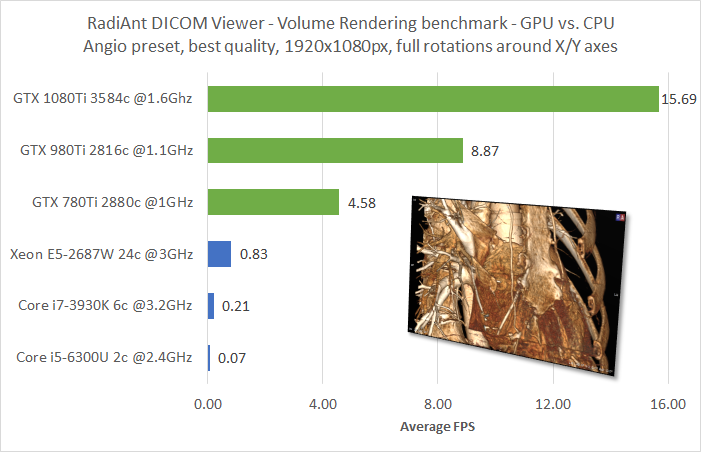 With the new version featuring GPU accelerated volume rendering just around the corner, we would like to take this opportunity to publish some interesting benchmark results. The difference between CPU and GPU performance, as far as volume rendering is concerned, is remarkable. Just have a look at this chart. Summing up, a powerful NVIDIA GeForce card (like GTX 1080Ti) will let you enjoy fluid, non-pixelated, full-screen, interactive volume rendering in RadiAnt DICOM Viewer. Our latest beta version features 3D Cursor, a tool that lets you quickly localize the same structure in different series. It can be helpful when viewing series either with the same image orientation (e.g., pre and post-contrast CT) or different image orientations (e.g., MR study of the spine with sagittal and axial series). Visit our forum to read more details about this feature and download the beta version. Currently there are a few sample presets available, we will add more in future versions. We will also add a possibility to create your own 3D presets. Read more and download the latest version.